I've been trying to find a product I vaguely remember being in the DAZ store, but can't find it. I'm not sure if I'm just not putting the right things into searches, the product used to be in the store but has been withdrawn/retired, or my memory is just muddled (it's certainly fuzzy enough these days) and actully no such thing ever existed here. It's a robot or robotic machine, NOT humanoid, NOT with legs like a mecha, rather a R2D2-ish cylindrical dustbin like thing that patrols as a guard. I have a hazy impression of the name or description involving 'guard', 'guardian', 'security' or something like that. It's NOT the PPU-T2000, or the R-Ex 2400 or the SRB 800. If it existed, my suspicion would be it was a Serrge item, maybe a PC 1.99 or weekly freebie (although I'm not certain about any of those things), and not at all recent ... several years ago. Does anyone recognize what product I might be talking about? It's quite possible I even have it, but have never used it and am not searching my runtimes with the right search terms to find it either. There is other products as well that I noticed are no longer sold on this site. Daz Mill Dragon Tack - is no where to be found- I recommended it to a friend but we could not find it listed anywhere. Particle FX with dragon fire. for Daz 3 and Poser - no longer is on the site. I had recommended it as a FX tool for to someone on YouTube who uses poser. no longer can be found. and I'm not talking about http://www.daz3d.com/shop/particles-3-pz either. 3-d-c has a couple of droids/bots, in his Kazonica (?sp) set, some as freebies. It may be one of those? No, it was definitely something here. It may wel be that I can find something else at another site that will do the job. It may also well be - given my fuzzy memory - that this thing that was here, whatever it was, wouldn't actually be suitable for the purpose. But it's just driving me up the wall that I can't remember the name and the details of the thing that is/was here at DAZ. And as I say, I may well even have it in one of my runtimes somewhere, if I could only remember whaat it was called. maybe it was one of the antfarm bots? Yeah, Ant's bots are pretty famous. They and some other promising-looking ones turn up in a ''Bot'' search. A couple of more for "droid". "patrol" finds this ruther intimidating thing, but it's got legs and a lightbar (added textures take away the police paint). You could shrink it, if need be. Mill Dragon Tack is in the first "vault" (Generation 1 & 2). D-Bot was/is in a vault, but it's humanoid. No "droid" vaulted. There's a PC $1.99 droid, but it's humanoid. No "security" or "guard" or "patrol" or "watch" bots vaulted. I thought there was something called the Centinal or something similar and one called the Guardian, but I can't find them in the shop, both PC items. Any of these ring a bell? No, it's not any of those. Not anything that comes up now from searches on robot, bot, droid, Serrge, Predatron, Valandar or The Ant Farm. Which is why I'm thinking that it's something withdrawn from sale awhile ago. But I'd still like to know what it was. Maybe one of those discontinued robots? 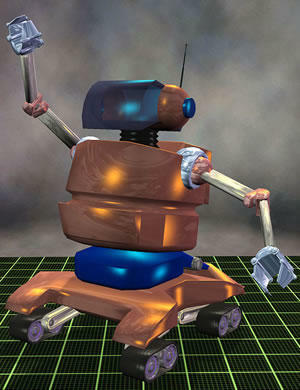 Or the still available CS ButtleBot3000? Edited to add the BDR 11. I think I know what you're talking about. It was free for a very short time and then pulled for reasons not to be discussed. ParticleFX for DS4.5 is on the way. Just be a little more patient. Draw us a picture of what it roughly looked like..
For those wondering the model the OP was looking for is clockworkFamiliar. Oooooh, now that sounds neat. Post a piccy? Thanks. I'm on UK time, and the PM was after I'd stopped with the computer for the night yesterday. Unfortunately it's not the whatever-I'm-remembering. No it isn't. Quite definitely not. The thing I'm trying to recall is nothing like as humanoid as many of the suggestions. No vaguely humanoid arrangement of legs and arms, whatever is in the middle. My recollection is that the product description described it as a mobile guard/security/sentry unit, with sensors to detect intruders as it patrols and at least a means of stunning them .... can't recall if it had a lethal force option or not. The very fuzzy image in my brain is of something cylindrical - or possibly cuboid - much taller than it is wide with maybe a hemispherical top ... think R2D2 minus the leg bits on the sides and stretched vertically, maybe. Not in the slightest anthropomorphised. Anything that looks like it has arms, legs and a face isn't it. 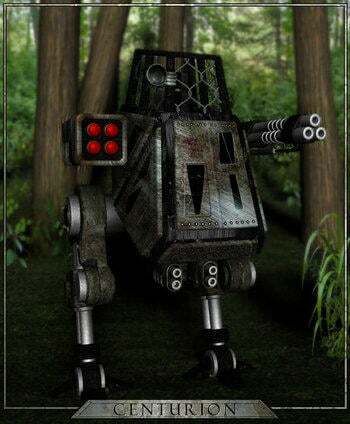 Anything that looks like a combat walker or mech isn't it either. LOL For some reason I thought Patience55 was looking for the model name when I got the PM . Sorry DavidGB. Woohoo the search goes on. Really, could you make a drawing? Even if it is crude or done in crayon on a napkin... I think it might help. Or go down to the police station and get one of those sketch artists to do it. That would be cool actually lol. 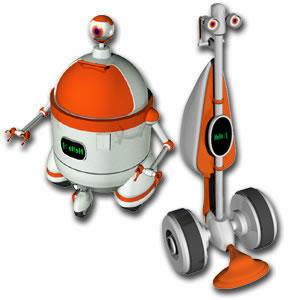 Well, if we never guess it at least we're going to have a nice long list of robots lol! Any chance the idea is from any movies or television series? There was a hovering sphere model [somewhere] that had little circles on it to shoot lasers from. Could it be that you are thinking about a Dalek from the TV series "Dr Who" ?